To understand the meaning of The Lorax story, you first need to understand that there is a war going on that started a long time ago. And I’m not referring to the armed conflicts currently raging throughout parts of the Middle East and Africa. This battle is raging all around the world, from the biodiverse Amazon River basin to South Africa’s Kruger National Park, from the polar ice caps in the Arctic to the lush rainforests of Indonesia. On one side of this war are those people and corporations who would exploit Mother Nature’s natural resources for their own profit. On the other side are the indigenous people and wildlife that call these areas home, who need those same resources for their very survival. This conflict is nothing new: Theodor Geisel, a.k.a. 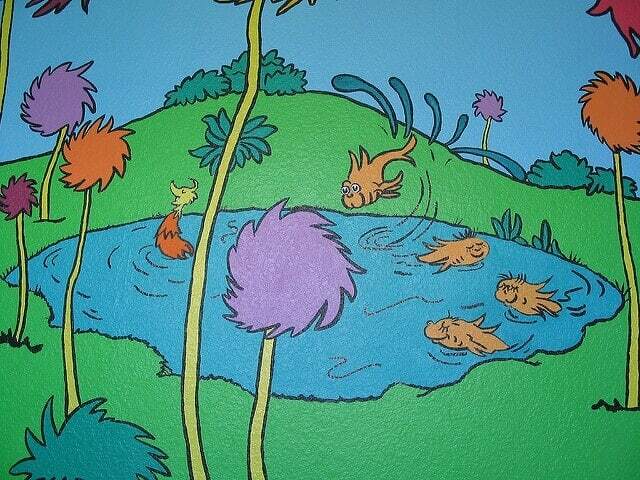 Dr. Seuss, wrote about the importance of environmental awareness back in 1971 in his prescient book, The Lorax. And the meaning of The Lorax has only grown more relevant over the past four decades. 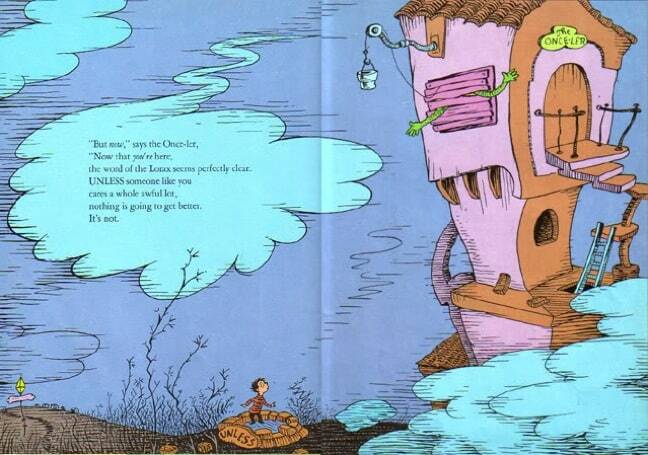 Through his clever storytelling, Dr. Seuss assumed the voice of an outspoken environmental advocate. 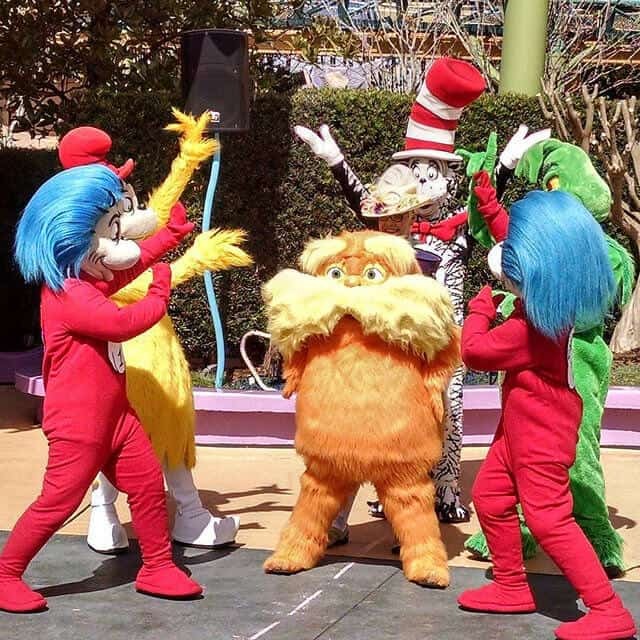 Here’s a quick summary of the Lorax: The Once-ler, sees economic opportunity upon his first visit to an Eden-like environmental haven. What begins as a charming tale quickly turns dark, however, as the Once-ler harvests Truffula Trees to create a product called Thneeds. 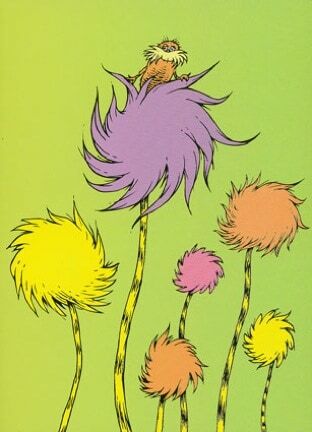 Their mass production leads to the extinction of Truffula Trees, leaving the area a barren wasteland completely devoid of life. The meaning of The Lorax couldn’t be more clear: It’s a warning about the dangers of rampant environmental exploitation. It’s clear that he regrets the devastating impact his actions had on the area, whose once-pristine flora and fauna could be analogous for any number of bio-diverse regions of the world currently threatened by development. Recognizing the beauty of the Truffula Trees, the Once-ler chops one down and uses it to knit his first Thneed (which looks a bit like furry pajamas). But as demand for his product increases, he harvests more and more and more, until they are all gone. Once begun, the exploitation of nature is difficult to stop, so it’s best not to start. There is no place in the world where it is considered OK to cut off a person’s nose, or skin, or limbs. Yet Elephants are being killed for their tusks, Rhinos are being killed for their horns, Seals are being killed for their skins, and Sharks are being killed for their fins. These animals cannot stand up for themselves. And if we don’t do it, who will? For far too long, people have trusted governments and corporations to do the right thing. “The Lorax: Which way does a tree fall? But the Once-ler is a great example of how someone with good intentions can make very bad decisions when there’s money to be made. Only by combining our collective voices can we, the people, truly have a say in the creation of environmental policies that encourage the sustainable development of a green economy. The Once-ler begins chopping trees and making Thneeds four times faster, never once considering the long-term effects on the planet. 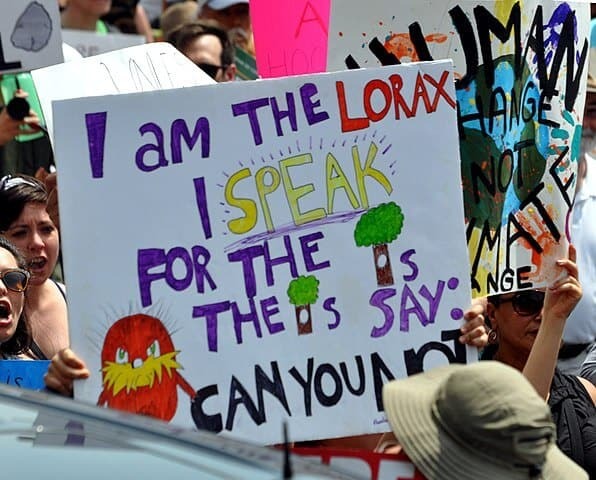 “I’m the lorax who speaks for the trees which you seem to be chopping as fast as you please. and happily lived, eating Truffula Fruits. 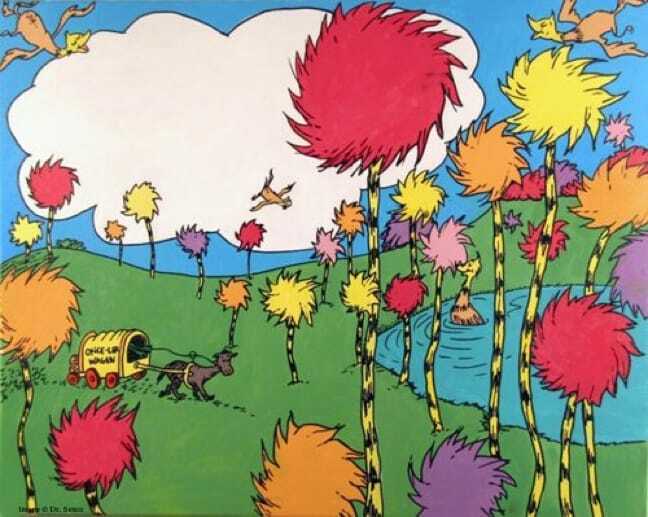 First the Brown Bar-ba-loots, who fed on the Truffula Fruits, go hungry. Then, as the noxious fumes from the factory poison the water and air, the Swomee-Swans and Humming-Fish leave. All too often, oil and natural gas companies begin drilling without understanding the long-term environmental impact. More often than not, it’s devastating both to humans and wildlife. 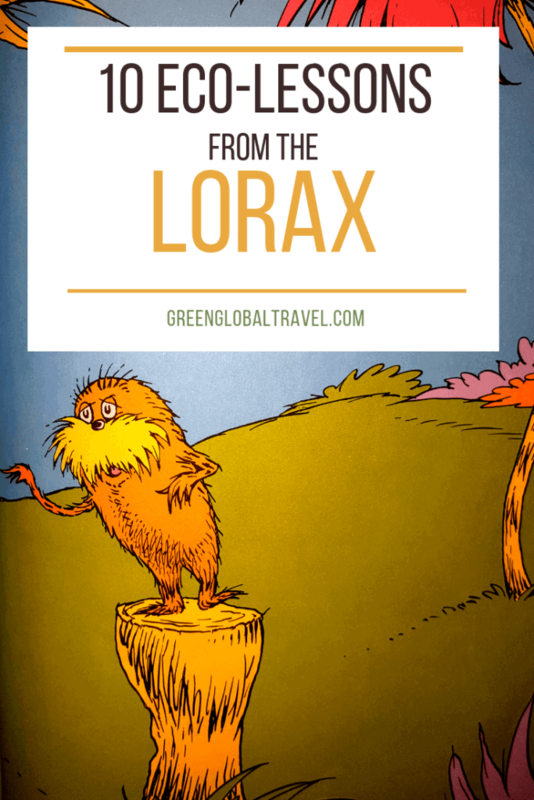 Dr. Seuss’ trees in the Lorax could just as easily be the forests of Borneo, where illegal logging and oil-palm plantations are destroying critical habitat for the endangered Orangutan. This harvest may turn a quick profit, but how will the nation generate revenue once the forests are gone? Green industries such as ecotourism and renewable energy offer opportunities for more long-term profits via sustainable development. But many of our “needs” are manufactured via advertising. Most of the things we are sold an “needs” are hardly necessary for our survival. By Reducing our consumption, Reusing everything we can, and Recycling everything else, we minimize our individual and collective strain on the planet. 8. UNLESS SOMEONE LIKE YOU CARES A WHOLE AWFUL LOT, NOTHING IS GOING TO GET BETTER. IT’S NOT. When the Lorax disappears from the barren wasteland, he leaves behind a small pile of rocks with one word carved into them: UNLESS. This is his warning, “Unless someone like you cares a whole awful lot, Nothing is going to get better. It’s not.” Just as climate change and an ever-increasing number of endangered species are Mother Nature’s warning to all of us. 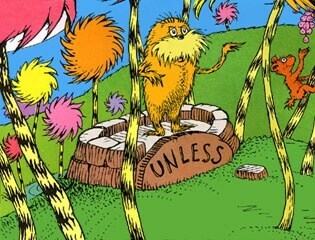 We must think of ourselves as the Lorax, and we must take action on behalf of the environment. Unless we do, things have no hope of getting better. At the end of his story, the Once-ler gives the boy to whom he is telling it the very last Truffula seed, encouraging him to plant it. “Catch! calls the Once-ler. He lets something fall. It’s a Truffula Seed. It’s the last one of all! You’re in charge of the last of the Truffula Seeds. 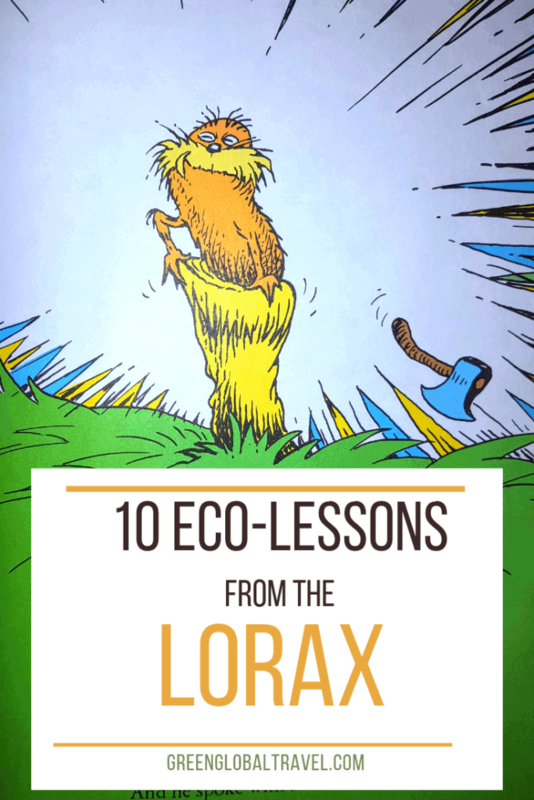 The ultimate meaning of The Lorax is that educating children about the importance of environmental stewardship is our best hope for nurturing the sustainable development of a green economy. Somewhere in the world right now, there’s a young boy or girl who may one day develop a revolutionary form of alternative energy, or an innovation in sustainable agriculture. They need our help to learn and grow! It’s not too late for us, as individuals, to take action. Plant a tree! Conserve water! Learn how to live more sustainably and travel more responsibly! Invest in Clean Energy! 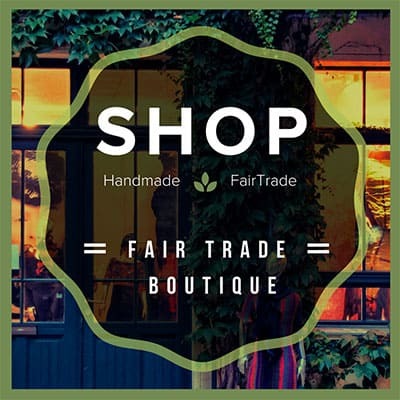 Write your Congressman and urge him/her to support pro-environmental legislation!